The country is split but is also moving left of center. I am not interested in rerunning the campaign and worrying about who is to blame for what strategy. Every campaign makes mistakes, and the campaign takes on the character of the candidate on the top of the ticket. Let's be clear, both candidates set out clear agendas and Obama's agenda of increasing spending, furthering government interventions and crony capitalism won. Obama's case was that government is the engine of growth not the private sector. The private sector exists to government bidding. Obama promised security. Romney's case was simple, he did not promise free goods but opportunity, and distinguisehd that the private sector and individuals are responsible for growth in jobs. 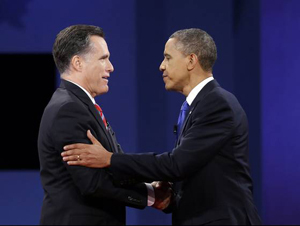 Romney had the better argument, but the populace preferred security of the dependency state. Which brings us to where we are now. Obama has his mandate to further transform this country and the only thing standing in his way is the Republican-controlled House. As one pundit observed, the silver lining of this defeat is that Obama must now inherit the result of his bad policies. We have the fiscal cliff with the biggest tax increase around the corner threatening to cripple the economy, the implosion of the European Social Democratic state and the possibility that the European recession spreads to the United States. Obamacare is ready to ruin the best health care system in the world, and many in the Middle Class will find that they will be paying higher taxes for the free medical care. And least, we forget, Middle Class income has been falling. Obama has gotten away with blaming Bush for his own failures, but after January of next year, he owns the economy and the question is not is there going to be a recession but when? As the joke goes, Obama can blame the President of the previous four years for any more failures. The question that remains is what does the Republican House do? The Senate failed to pass a budget for four years and made it clear that had Romney won, they would stiff them as they stiff the Republican House. With a pliable media, the Republican will get the blame for any obstruction, but then the Republicans can certainly work together with Obama on serious entitlement reforms or even tax reform on the line of Erskine Bowles-Alan Simpson. The President has his mandate, and if his agenda falls short, Republicans have an obligation to oppose it.